Ed Haskins’ Bulldogs are off to a blistering 2014-2015 campaign as the state champions of 4A last season are poised to make a run at the 3A title this year. They took a short trip southwest on Tuesday night as Chief Sealth hosted the Metro League leader. Seahawk coach Colin Slingsby certainly understood the tough task his team would face, but he nor anyone in the gym expected this contest to finish the way it did! Garfield started its scoring onslaught early as the pressure applied on defense resulted in routine buckets on the offensive end. Jashaun Agosto displayed his dynamic skill set as the shifty point guard distributed the rock to open teammates and created open looks for himself at the cup. Alphonso Anderson also got in the mix by burying shots from downtown to help the Bulldogs notch 57 first-half points. 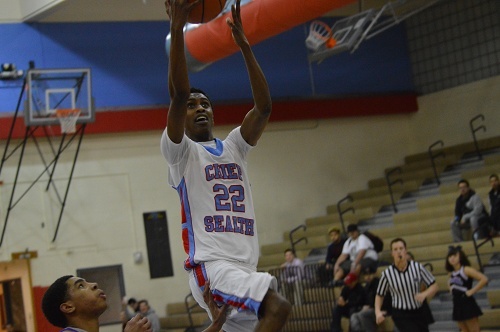 Sealth senior Ahmed Mohamed kept his team on pace by recording 10 first half points. At the break, Garfield jumped out to a comfortable lead at 57-34. The triple threat of Agosto, Anderson, and Jaylen Nowell kept the explosive tempo going into the second half by contributing an additional 24 points in the third quarter. The trio combined for 79 points! Garfield’s defense clamped down too by limiting CS to only 7 points in the frame. Effectively, the outcome of the contest was settled before the fourth quarter, but the highlight of the night was yet to come. With a running clock in effect and the final minute coming to a close, Chief Sealth received an inbound on the Garfield baseline. The ball was lobbed above the rim with Hafid Yassin in stride. The 6’5 senior launched his body above a Bulldog defender and threw down a dunk for the ages. He elevated his head above rim level! Moments later, Sealth buried a three-pointer to end the game in the most dramatic way a 41 point loss can happen. The atmosphere in the gym when the game ended was as if the crowd just witnessed an overtime buzzer-beater. Garfield keeps their immaculate record intact, Sealth walks away with a memory of a great moment in program history.